Cool, tranquil water, shimmering in a garden pool, seems to wash away cares and tension. To bring water-garden refreshment to your container collection, you will need only a few springtime hours and a few simple ingredients: a suitable container, a sunny site, gallons of water, some bog or aquatic plants and a few water snails and goldfish to help keep the pool clean. 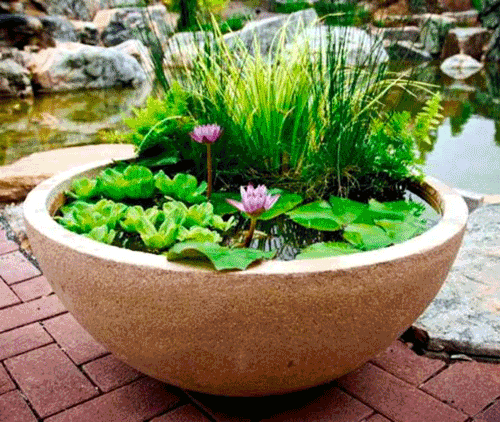 Container Tips: If you want a good sized water garden, buy a 25 gallon at least container; almost any leak proof vessel of the appropriate capacity will do. Avoid terracotta pots since it is meant to absorb the water and will break down faster. A colorful glazed bowl is a great place to start. You can also use concrete, poly resin, sandstone, black clay that is high fired, metal or any other strong and durable material. It is best to select a container without drainage holes, but if there are pre-drilled, be sure to plug them tightly before filling with water. There are many silicone products available at your local home depot. 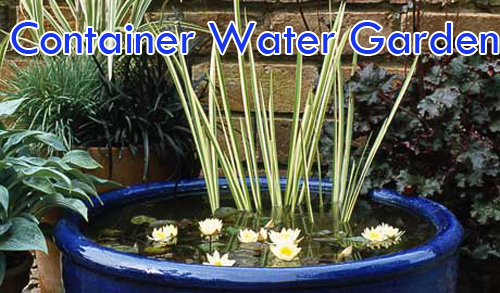 Selecting a site tips: Because a water filled container is heavy, it makes good sense to set up your water garden in its permanent location. You may prefer to place it on garden ground rather than on a deck or patio: the pool will have to be drained and scrubbed once a year, and there's always some chance of seepage. As you evaluate possible sites, remember that it's important to provide plenty of sunshine: most aquatic plants need at least 6 hrs of full sun daily. Filling & planting tips: Before placing the pot in it's permanent home, fill it with water, then clean out any debris that may be in the pot. Drain and refill the pot and let it sit for a week before planting. With the exception of plants which simply float freely on the surface, aquatic plants must be potted before being placed in the pool. Plastic pots are best, since they hold up. Fill pots with garden loam and inch thick and top with sand to keep them from floating. Submerge planted pots in the pool, usually positioning them so pot tops are 6" or more under water. A few plants do best if only partially submerged. To raise plant to the proper height, you will need to set up pedestals made from bricks or overturned plastic pots. 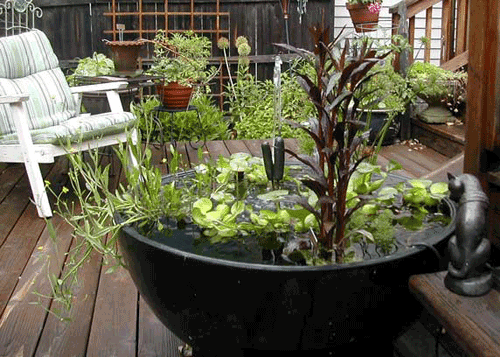 Add a goldfish or two to keep the water free of insects. A few snails help keep the pool clean by nibbling algae and decaying matter. Once a year drain the pool and scrub it out with a mix of water and bleach. 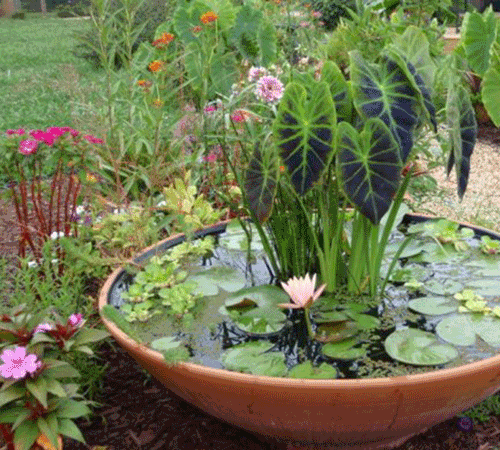 Suggested plants: Umbrella plant, dwarf papyrus, water hyacinth, horsetail, japanese iris, water lily and arrowhead.